Nara, with its many ancient tombs and heritages, is a treasure trove of Japan's beginning history. 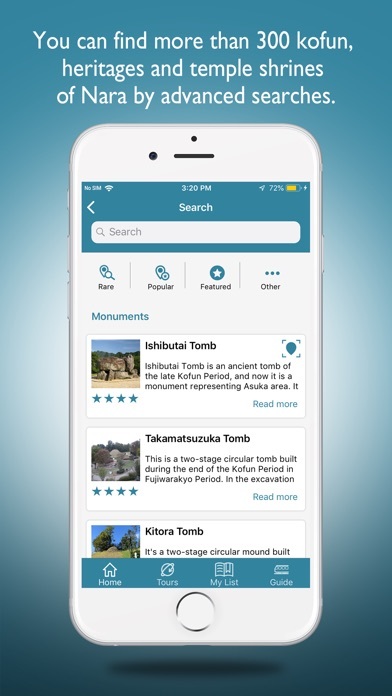 “Nara Kofun & Heritage Tours” is an application that allows you to make your own trips more fun to enjoy tombs and ruins, temples and shrines, and beautiful nature in Nara using a lot of friendly features such as AR and AI. ●Many off-the-shelf tours prepared for you who visit Nara first time We have prepared many package courses for famous archaeological sites, tombs, temples and shrines, and even nature, so even if you are new to Nara, you should feel fun of visiting heritage sites in Nara.With stamp rallies, you can enjoy the heritage tours. 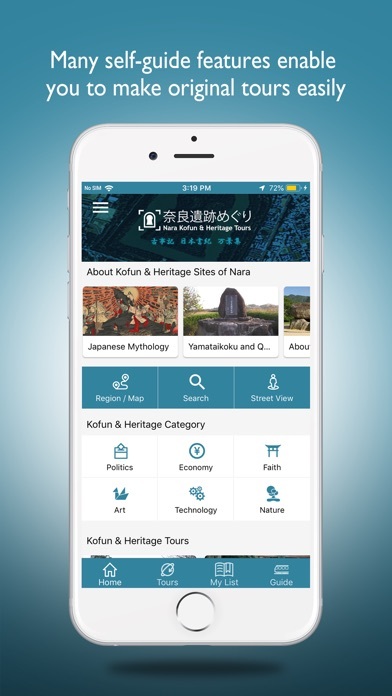 ●Many self-guide features enable you to make original tours easily You can find more than 300 kofun, heritages, and temples/shrines of Nara by yourself.You can search for tourist attractions such as ruins etc. 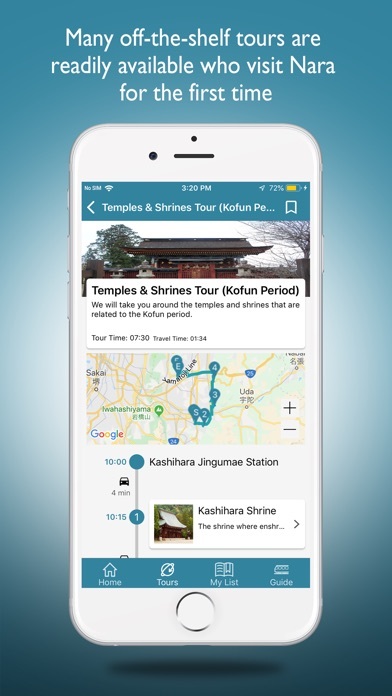 by theme, prefecture map, or free phrases.Suitable for Western travelers who like to find out and travel by themselves.Repeaters who experience the Out-of-the-shelf Tours can create and travel on their own. 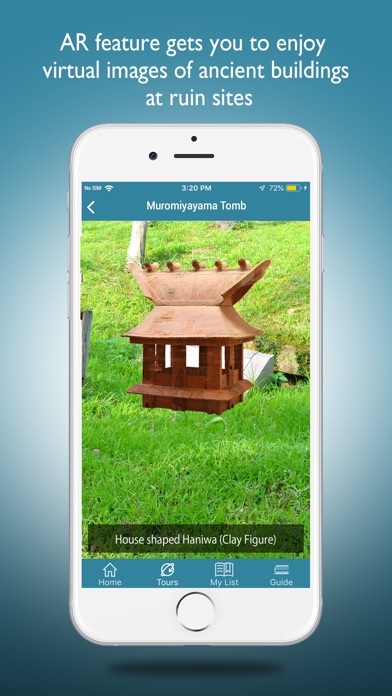 ●AR feature gets you to enjoy virtual images of ancient buildings at ruins You can enjoy sightseeing trips more at the ruins, since you can use the AR feature to see virtual images of ancient structures in the vicinity of the ruins, such as Makimuku Ruins, Asuka Palace, Ishibutai Tomb, and Fujiwara-kyo Palace. ●Chat with our bot to use Japan’s complicated transportation systems easily Japan's transportation system is complicated. 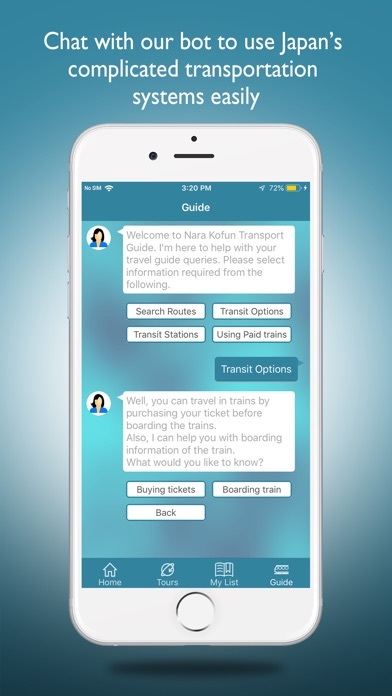 Using chatbot, the app will give you guidance on how to use transportation and transfer methods in an interactive manner, so even first-time travelers can easily go to the destinations in Nara. ●About Access Permissions ・ Location information (GPS)The app gets latitude / longitude of current location to search various facilities from your current location. ・ Network communicationThe app performs Internet communications for search of various facilities information and routes, and preservation of user information. ・ CameraThe app accesses the cameras for displaying AR images. ●Disclaimer ・Even if any disadvantage is caused by the use of this app, we do not take any responsibility.